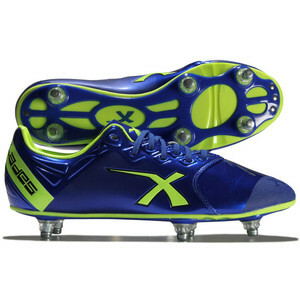 Helping you hit the target and make a mark, the X Blades Sniper Speed 6 Stud SG Rugby Boots are a lightweight performance offering. The inclusion of metal tipped screw in studs means you are ready to tackle any natural soft surfaces all year round. Totalling six in number, the heel pairing bring stability to your play while the forefoot ones are all about power in your game. If you are looking to get you play noticed then you can't go wrong with a bright show of electric blue and yellow while the black detailing does add a more refined touch to the X Blades branding. This boot weighs 286g (UK 8).